CRISM's flexible operation allows it to switch electronically between a high-resolution, targeted, hyperspectral imager and a global multispectral mapper. CRISM uses the spectrum of reflected sunlight to determine the mineralogy of the surface, a technique called reflectance spectroscopy. CRISM also is an imaging spectrometer, because it acquired data that are built into an image. Someone with little familiarity with rocks can easily distinguish a piece of basalt (black, hardened volcanic lava) from a limestone (a light-colored sedimentary rock) based on color. However some very different rocks may look alike based on color alone – at least to the the human eye, which detects only three visible-light wavelength ranges (red, green, and blue). For example, slate (a metamorphic rock) is also black and fine-grained like basalt, but is made up of very different minerals. Reflectance spectroscopy extends mineral discrimination based on color to wavelengths not visible to the naked eye. Most minerals – chemical compounds that make up part or all of a rock – preferentially absorb light at certain wavelengths. Dips in the spectrum of reflected light at those wavelengths, called absorptions, provide "fingerprints" that identify the minerals. 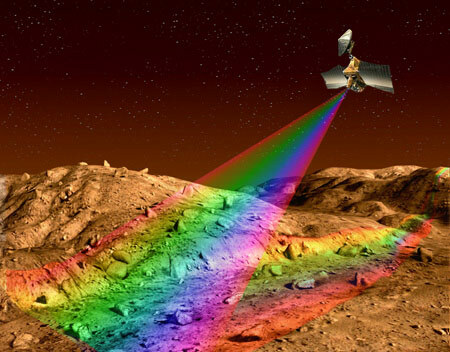 Different martian minerals, some of which indicate ancient liquid water, can be identified by the "fingerprint" of absorptions in their spectrum of reflected sunlight. On MRO, the Sun provides light that is reflected by the Martian surface back towards space to be detected by CRISM. For every pixel in one of its images, CRISM measures a spectrum of that part of Mars. Matching the absorptions that are observed with known mineral absorptions allows us to make images, and maps, of Mars' mineralogy. 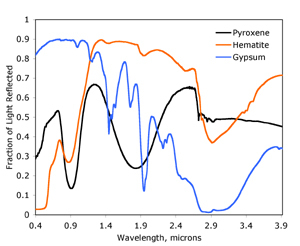 For example, the plot at right shows the fraction of light reflected by three common Martian minerals at different wavelengths. Each of the minerals is generally found in a different kind of rock and indicates a different kind of environment. Pyroxene indicates igneous rock, whereas hematite shows where those rocks have been oxidized. Gypsum indicates a past liquid water environment. Each of the three minerals can be identified – and the past environment inferred – from the wavelengths of the absorptions.